MainAll NewsMiddle EastANALYSIS: Did Iran order recent terror attacks against Israelis? Evidence points to the fact that PA Arabs have become part of the Iranian Axis. Judea and Samaria, a.k.a. the 'West Bank,' is once again experiencing an uptick in terror attacks by Palestinian Arabs. This week Arab terrorists not only carried out two deadly drive-by shooting attacks on groups of Israelis near the village of Ofra Sunday evening and Thursday afternoon but also staged a number of stabbing and car ramming attacks on Israeli security personnel in Jerusalem, Judea, and Samaria. “A volcano of violence is waiting to erupt in the 'West Bank',” Israeli journalist Anna Ahronheim wrote while repeating the trope blaming high unemployment and a lack of “hope” for the escalating violence. Citing data released by the Israel Security Agency, or Shin Bet, Ahronheim reported 109 terror attacks in Jerusalem, Samaria, and Judea in October alone compared to 80 in September. These attacks included the use of improvised explosive devices, arson attacks, fire bombings, car ramming attacks, shootings, and stabbings. “Incitement in Palestinian media against Israel, including by PA President Mahmoud Abbas, has not helped calm the situation,” according to Ahronheim, who also claimed the economic situation in territories controlled by the Palestinian Authority (PA) has become more difficult since the United States decided to withhold funds for the PA and the United Nations Relief and Works Agency (UNRWA). Indeed, Abbas continues to incite Palestinian Arabs against Israel and has again threatened to cease security cooperation with the Israeli security forces in Judea and Samaria. On Wednesday Arutz 7 reported that “Abbas would hold a series of urgent diplomatic contacts with Arab and international elements over the next few days in order to spur them to act against the dangerous Israeli escalation that is manifested in incursions into Palestinian Authority cities, continuing the crimes of the settlers and the desecration of the holy places." The PA statement omitted the fact that these “incursions and attacks” were the result of an Israeli manhunt for the murderers of unarmed civilians Kim Levengrond-Yehezkel, 29, of Rosh Ha’ayin, and Ziv Hagbi, 35, from Rishon Lezion who were murdered in cold blood by a 23-year-old Palestinian terrorist in the Barkan industrial zone near the town of Ariel last October. The PA also didn’t mention the manhunt for the murderers of Amiad Israel a Jewish baby who died of his wounds four days after his pregnant mother was shot at the bus stop in Ofra and after doctors in Jerusalem tried to save his and her lives by conducting an emergency Caesarean section operation. 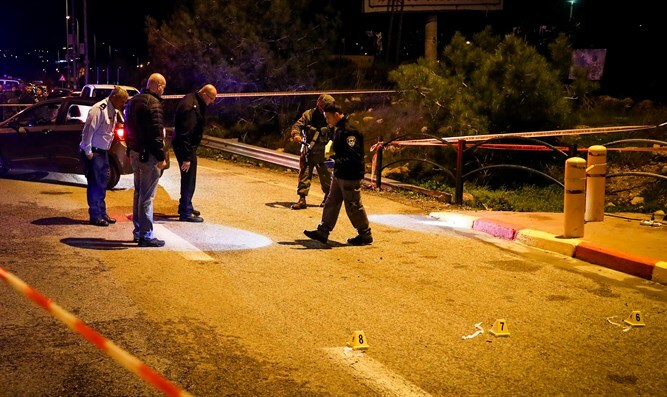 The Shin Bet, working in coordination with the IDF and Israeli police, on Wednesday evening apprehended four Palestinian Arabs suspected of conducting the shooting attack in Ofra, eliminating a fifth one who opened fire at the Israeli security forces. Several hours later, Israeli security forces shot dead Ashraf Walid Suleiman Na’alowa, the terrorist who murdered the two Jewish Israelis in the Barkan Industrial Zone of Ariel. Na’alowa was reportedly preparing for a new terrorist attack and tried to evade his attempted arrest, which took place in the city of Nablus (Shechem) in Samaria after a large-scale intelligence operation involving the use of cutting-edge technology. “The finding of Na’alowa, which was carried out by the ISA, IDF and Israel Police anti-terror unit, was the culmination of a ramified intelligence effort led by the ISA, and which included various intelligence, operational and technological capabilities. The ISA investigated several suspects who had aided – or were aware of – Na’alowa's activity. Several suspects have already been tried,” according to a Shin Bet press release. However, the escalating terror in Jerusalem, Judea and Samaria is not the result of a lack of hope or the prevalence of poverty among Palestinian Arabs. The Palestinian terror groups in Gaza have simply become part of the Iranian axis which is constantly trying to deprive Israel of tranquility. The Quds Force of the Iranian Revolutionary Guards Corps was responsible for the rocket barrage that hit Israel on November 12, according to IDF spokesman Lt. Col. Jonathan Conricus. Iran is also working in tandem with Hamas to keep up the pressure on Israel and in 2012 founded the terror organization Harakat al-Sabireen Nasran li-Filastin,” or The Movement of the Patient Ones for the Liberation of Palestine. Sabireen is a Shiite faction in Gaza and has between 400 and 3,000 fighters at its disposal. It receives $10 million in funding annually from the Mullahs. In response to the missile attacks on southern Israel, the Israeli air force (IAF) launched 150 strikes and destroyed much of the terror infrastructure in Gaza within two days without causing civilian casualties and without the IDF launching a ground operation - this time. Since then, the southern front has been relatively quiet, most likely because Hamas and the other Palestinian terror movements in Gaza don’t have the capability to continue their war against Israel at the present time. It is therefore reasonable to conclude that Iran has now ordered Hamas to shift its focus to the front in Judea and Samaria.